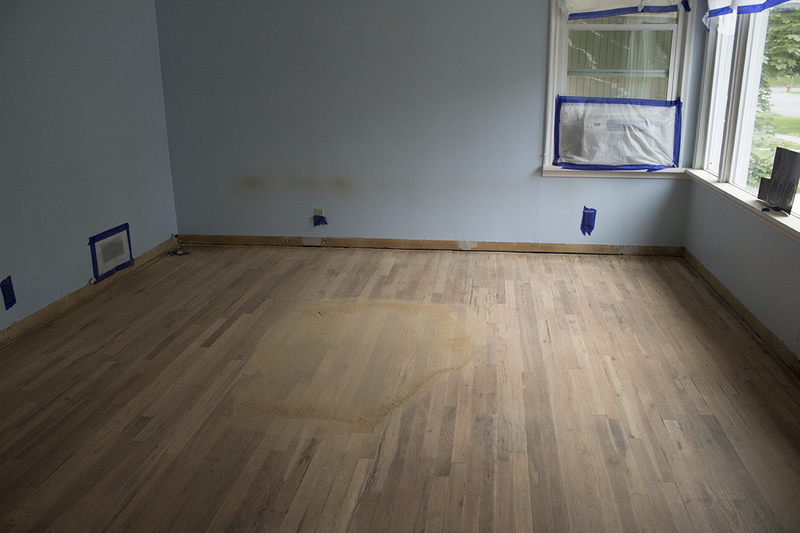 Before we started this project I envisioned the floors getting sanded and looking like they were brand new again, but after hours and hours of sanding I came to the realization that this was not going to be the case. Wood floors can be sanded down and reborn in many ways, but there is a point, that if passed, they will never look new again. Our floors probably passed this point ten years ago. No matter how much I sanded, and how low of a grit I got, there were just some things that were not going to go away. The wear doesn’t look gross though. The wood is smooth, and the satin poly we put down made them shine beautifully so that the remaining scrapes form quite an endearing patina really. They are more honest than if they looked brand new and I like that. Before we got started with this sanding phase, I didn’t really know what to expect. Based on what I had read Online I pictured myself surrounded in a cloud of dust that would cover my entire house like a sandstorm. I pulled out the goggles. I got the expensive sanding mask. We spent hours taping off every inch of things that we didn’t want dust to destroy. In actuality, yes, there was some dust. I would even say there was quite a lot of dust by the end of the day, but it wasn’t flying around like a storm and it wasn’t piling up like sand in the corners, it just kind of sneakily settled on the windowsills and took forever to get completely off the floor before we put down the poly. Yes it was a good idea to tape off the outlets and rooms we weren’t sanding in, but it wasn’t nearly as bad as I expected. We used one of those large square sanders that moves in a random orbit pattern which we rented at Home Depot for a day. A lot of people will tell you to get the round buffer ones, but go for the square one. It doesn’t leave the swirly lines on your floor. We were advised to start off with 80 grit sandpaper, so we loaded up on that and the progressively finer grits and took our sander home. Aaron had to go to work that day so we kind of figured out how the machine worked and then he left and I started sanding away. I started out in our bedroom by going over each section slowly and the finish came off like I was just vacuuming it up. I was getting all excited thinking this was going to be way easier than anticipated, but unfortunately, the remnants of 20 year old finish were the least of that floor’s problems. That stuff would come up if you scraped it with your fingernail but I quickly realized I needed a lower grit of sandpaper because the 80 was doing essentially nothing for the scrapes. Unfortunately, paint does not come off like it’s being vacuumed up. Neither do deep scratches. Or hair dye for that matter. I drove back to Home Depot and bought some 60 grit to get started instead because I felt it would be more effective. I decided to just go over the floor like normal and then figure out what would need more attention later. Most of the paint splotches came off with the sander except a few of the larger spots, but the paint around the edges of the room where the trim hadn’t been taped off when it was painted was too close to the wall for the machine to get at. I decided to finish up all the machine parts and then go back with the hand sander later. I spent all day sanding with the machine. When I got to the second bedroom I had to take another trip to Home Depot to get the 35 grit paper. It was basically like sanding your floor down with gravel, but that’s what it took to even make a dent in that back room. The area with hair dye was particularly time consuming and there are still some pretty serious gouges near the closet, but, you do what you can and as I mentioned earlier, it gives it a authentic patina. I finished up the heavy grit around five when Aaron got back from work. He took over the machine because my arms felt a little like jello after all day of using that thing. He finished up the finer grits pretty quickly and then we got down with the hand sanders and sanded until our forearms were going to crumble. Getting the paint off from around the edges of the walls was the worst. It was very, very slow going and we worked on it the rest of the evening and all of the next day. 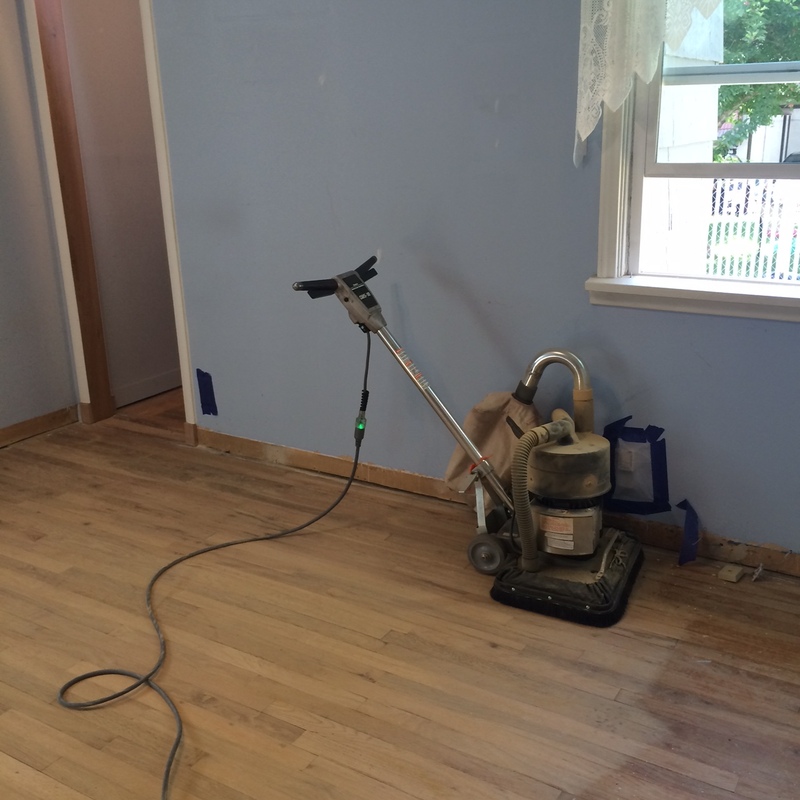 A pile of sawdust swept to the center of the living room, which has been machine sanded.